The bulk of the information about great teachers' traits that follows on this page comes directly from a recent Florida Times-Union article. 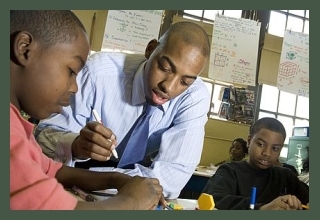 A compelling study done over a nine-month period ending earlier this year revealed some intriguing things about successful teachers. As you know, we've all had them. They're part of who we are, the teachers in our lives who motivated us to be better human beings. Some of them stretched us so far that we might have thought ill of them at times. But in the end, they were the ones we called our favorites, the ones who stood out because they helped us overcome challenges and inspired our intellectual curiosity. Is there an X-factor that makes a teacher extraordinary? Is there a special formula that teachers use to move students academically--and on to bigger futures? Suzanna P. Barton, editor of the Resident Community News Group, and WJCT education reporter Cyd Hoskinson interviewed successful public school educators through a grant from The Community Foundations Philanthropic Initiative. Each might use unique techniques--a conga line to teach division, for example-- but together their love of teaching is potent and contagious. Here are some of the common traits (in the order that the researchers listed them) that great teachers share on education's front lines. 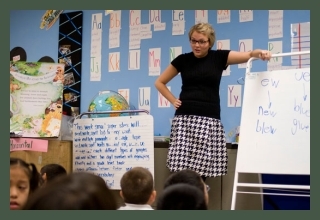 Laureen Martin, a fourth-grade reading and writing teacher from Pinedale Elementary School and one of the five 2012 Teacher of the Year finalists for Duval County, originally tried to run from her calling. But in an interview with a Teach for America representative during her senior year at the University of Florida guided her back. And I wasn't sure how to answer that question," Martin said. "So she said, 'Why don't you consider teaching?' My mom and my grandfather had been in the education business for a very long time. And despite my struggles to be the different one in the family. I felt it was my calling. It was put on my heart." A fourth-grade reading and writing teacher from Windy Hill Elementary School, Chris Braddock says his students' achievement begins and ends with him. "It's me starting at seven o'clock every morning for a lot of my kids," Braddock said. "It had me ending at six o'clock at night for some of my kids. It's me on Saturdays. It's me all day long. And I can't put the burden of that child's success on someone else when I know that it's me all day long. So I carry the burden on my shoulder proudly. I want to know that I have done right by that child. They deserve that from me. That's my job." Edward Moore teaches seventh-grade language arts at Northwestern Middle School. When he looks at the kids in his classroom, he imagines them as extensions of his own children. He wants his kids to have a great future--and to do what he can to give his children what a father would give them: "That's my all." "Facilitation is my role in the classroom. But beyond the classroom--and even within the classroom--a teacher wears many hats," Moore said. "You become a counselor, a father figure--a parent. A lot of my students will refer to me as Daddy Moore. It's funny at first, but then you realize they really see you as their father figure, which makes you have to be more accountable." To Scott Sowell, the seventh and eighth grade science teacher at Darnell Cookman Middle/High School and a 2012 Florida Blue Duval County Teacher of the Year, this quality is "absolutely key." "As teachers, we know through research that unless were shaken out of it, nine times out of ten we teach how we were taught. And if the way you were taught is really wonderful for you, that's the method with which you approach your own teaching," Sowell said. "But not every student is like you. It may not be good for all of my students. So you have to learn new ways through mentoring and teacher induction programs and college of education and field experiences. And, those new ways are more difficult to learn. "I had a student who was very disengaged in the morning," Cobbin said. "Each morning, we had a little meeting where we'd share what was going on. He didn't want to participate. So I tried to figure out what was going on. "I came to find out he was experiencing some things at home that had him living with other family members. He wasn't living with his mom. And no one wants to live without mom. So he was coming to school late every day and missing breakfast. Well, I started keeping snacks and things in my cabinet to give him. Every morning, he would come in late. And I'd let him go to his private little area and eat a granola bar for breakfast." "We all do it. As a teacher, you're a mom and you're a caretaker. It's what you have to do." "We have open strong relationships," Ashker said. "I think my students feel very comfortable in my classroom. They know that my room is a safe place; they can come in when they need to. "I'm not just a teacher. I'm a counselor and a social worker sometimes. But it seems like if that's what they need, that's what you have to give them. Obviously, I'm working on academics, but we cannot improve students academics until we address what they need socially and emotionally." Megan Miller, a Pre AP Civics Teacher at Switzerland Point Middle School in St. Johns County, meets with her colleagues to exchange information. "We have collaboration once a month at faculty meetings where someone's showcasing what they're doing in their classroom," Miller said. "And teachers figure out ways to adapt that to their subject area. It's huge." Cindy Fitch, a longtime educator who now teaches academically challenged students at Oak Hill Elementary School, uses her smile, puns, and a quick wit to resonate with students. "I enjoy laughing and having a good time," Fitch said. "I think you can make learning fun. It's either they're on my level as far as humor is concerned, or I'm on their level. We do a conga line when we learn division facts. They like the 'huh' part the best. "Anything you can do to capture their excitement and get them to know that you can have fun while you learn and listen." Heather Keiser, a soft-spoken teacher at Avondale's Fishweir Elementary School, is not quiet about this point. "I feel that early on, the best thing a parent can do is read every single night to their children," Keiser said. "I know teachers say it all the time, but if you read to them, you're your child's best teacher. They can't get that anywhere else but from their home. To hear their parents read with the fluency rate and how they read with expression, it's so, so important. They model what their parents do. If they come in with that, they're going to have huge gains." Sandy Brusca, a fifth-grade reading teacher at Plantation Oaks Elementary School in Clay County, said it sounds corny, but it's true. "If you asked me my teaching philosophy--I know it's cliché--but it's that all children can succeed," Brusca said. "That's a daunting task for us educators. But what I do in my classroom from day one is to set up the classroom as a welcoming and safe environment. I don't mean free from crime. I mean it's a safe place where they can take chances on their learning. They do have a voice and a say in here. I always tell them I respect them and their thoughts and strengths and weaknesses." Youmone Berrien, 10th-grade English II and writing teacher from First Coast High School, was the 2011 Florida Blue Duval County Teacher of the Year. Two years ago, 88 percent of her class was performing at a low level on the reading portion of the FCAT. By the end of the year, 21 of 24 students made vast improvements. She also founded the successful Ladies First Organization at First Coast High School to promote leadership and achievement in at-risk girls. "My dad is African, and he always said it takes a village to raise a child," Berrien said. "So I always say it takes a community to teach our students. It's not just one teacher. Community is key. The community is what we need to help us in the classroom." I have to say that the authors of this study have done an admirable and thorough job. However, I think three other factors can make the difference between a teacher and a great teacher. 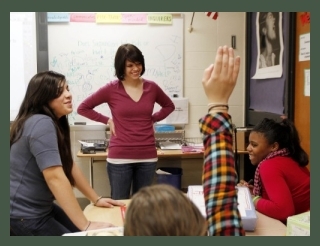 Great teachers design and establish effective classroom routines for a successful school year. And, they teach them directly to the kids beginning on day one. 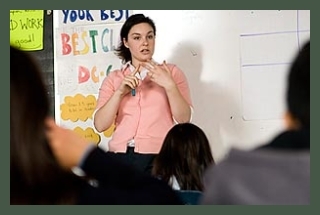 Providing a means for adequately motivating students and having a comprehensive plan for classroom management, as I've mentioned before on this website, are clearly two more traits that make great teachers. Thank you for becoming a teacher, and thank you for taking the time to go online in search of resources that you can use in your classroom. That tells me that you are a dedicated teacher. That also tells me that you care about your kids and that you are devoted to helping them prepare for their and our tomorrows. Go to Daily Teaching Tools Home from Great Teachers' Traits.